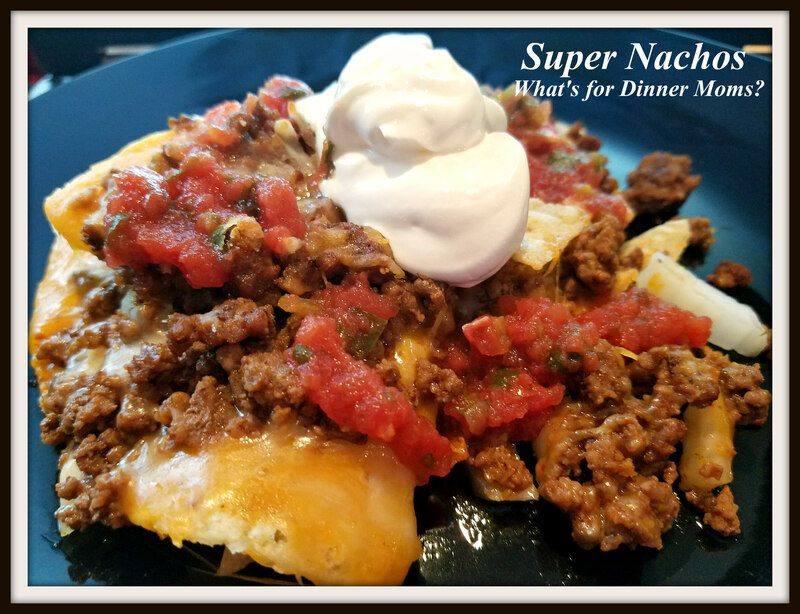 Super Loaded Nachos – What's for Dinner Moms? Shhh, it was not 9:30 pm when we were all home last night! It was amazing. My kids were so happy to just have a night at home. I had a meeting until 7:30 pm so we were able to have dinner by 8:15 pm. It was weird for us. We are a late night family and tend to eat dinner between 9:00 pm and 10:00 pm. Yes, really. Most of the kids events or classes don’t get out until at least 8:00 or 8:30 and by the time we get home and get dinner on the table? Yeah, 9:00 or 10. I wanted something super simple that I could get on the table quickly but be fun and yummy for us. I wanted this to be a bit of a “celebration” meal. We have had lots of good things going on lately and I wanted this meal to be light-hearted so we could all talk and catch up about our weeks. 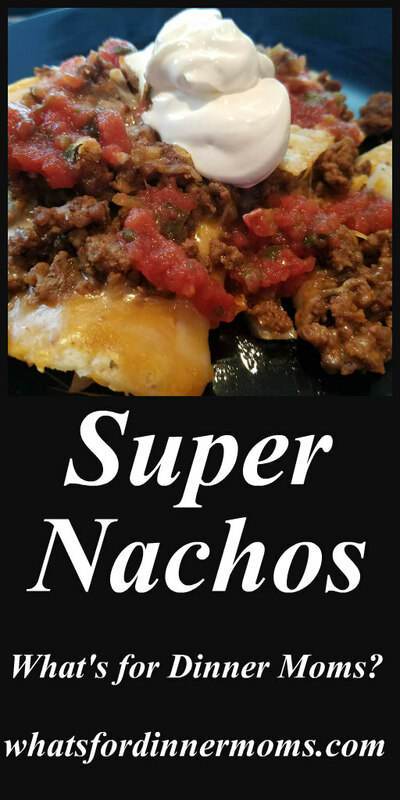 Nachos is the perfect meal. I loved this meal. I don’t know if it was the meal or the fact that we were having a nice time just sitting down around the coffee table in the family room chatting and eating. It was relaxed and everyone was not worried about what they were going to do next or where they had to be next. The food was good though. I only baked the chips until the cheese melted so they didn’t get soggy and put the toppings on after they baked so that they were still crisp. Preheat oven to 400 degrees. Prepare a rimmed baking sheet with parchment paper or aluminum foil for easier clean-up. Brown ground beef and 1/2 of onion in skillet over medium heat. Drain any fat off beef. Add taco seasoning and water according to package. Cook until the water cooks off. Remove pan from heat. Layer chips in bottom of pan. Cover with 1/2 of the meat. Sprinkle with cheddar cheese. Layer with chips over cheese and add meat. Cover with Monteray Jack cheese. Bake for 10-12 minutes or until cheese is melted. Remove from pan and serve hot with desired toppings. We like Nachos packed with Chorizo – especially for family game night. Play some games, take a break and munch away. Your recipe looks great! Thank you so much! My son would love it with Chorizo. Hmmm. Maybe next time. 9-10. Ouch! Lol. These busy lives we lead. Thanks. Yeah, we are a late family. Oh, this sounds like the perfect meal during the games of the upcoming soccer world championship in June/July! What a lovely family time! This looks very yummy, Marci. I could not eat a meal at 10pm I must say. We have dinner at 6pm. Pingback: Top 5 Recipes for May 2018 – What's for Dinner Moms? My daughter would live your name! That is her favorite food. I have not tackled that yet. Thanks Koolaidmoms! Sushi brings the whole world together ^-^ your daughter must be awesome!